Network Rail and a maintenance company will appear in court in February to face health and safety charges over the 2002 Potters Bar train crash. The case, brought by the Office of Rail Regulation (ORR), had been due to be heard by magistrates on 7 January. But the ORR said that proceedings would now start at Watford magistrates' court in Hertfordshire on 21 February. 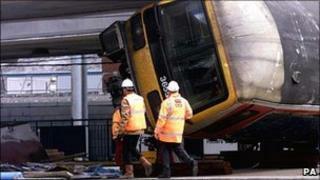 Six people died on a London to King's Lynn train which derailed on 10 May 2002. A pedestrian was also killed. The maintenance company, Jarvis Rail, which was the contractor for the section of track where the train derailed after a points failure, went into administration in March 2010. On Wednesday the ORR said Jarvis's administrators had provided the necessary consent "to allow the ORR to proceed with criminal proceedings against the company for the Potters Bar derailment". Overall responsibility for the track rested with Railtrack, whose functions were taken over by Network Rail (NR) in October 2002. Following an inquest into the disaster which took place earlier this year, the ORR announced in November that it was prosecuting Network Rail and Jarvis under a section of the 1974 Health and Safety at Work Act. Speaking at the time, Gerry Doherty, leader of the TSSA rail union, said: "It seems at long last we are going to find just who was responsible for this tragedy." The case is being brought over alleged safety breaches. A Health and Safety Executive report said poor maintenance was to blame. In 2005, the Crown Prosecution Service (CPS) said there was no realistic prospect of conviction for gross negligence manslaughter against any individual or corporation in relation to the crash.